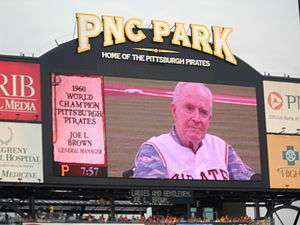 Image of Joe L. Brown taken from the scoreboard of PNC Park on June 19, 2010 in Pittsburgh, Pennsylvania. during the pre-game activities honoring the 50th anniversary of the 1960 Pittsburgh Pirates World Series team. Joe LeRoy Brown (September 1, 1918 – August 15, 2010) was an American front office executive in Major League Baseball. Brown served as the general manager of the Pittsburgh Pirates from November 1, 1955, through the end of the 1976 season. Under his administration, the Pirates recovered from four consecutive last-place finishes in the National League to world championships in 1960 and 1971. Led by the great Baseball Hall of Fame players Roberto Clemente and Willie Stargell, the Bucs were perennial contenders in the National League (and, after 1969, the National League East Division). Brown was a native of New York, but grew up in Southern California. The son of actor-comedian Joe E. Brown (Some Like It Hot), he inherited his father's passion for baseball. Brown first met Branch Rickey, his predecessor in Pittsburgh, when Brown was 16 years of age, in 1935. He entered minor league baseball after his graduation from UCLA in 1939 as a front-office official with the Lubbock Hubbers of the Class D West Texas–New Mexico League. He served in the United States Army Air Forces during World War II, then joined the Hollywood Stars of the Triple-A Pacific Coast League in 1946. Brown entered the Pittsburgh organization in 1950 as business manager of their Waco Pirates farm team in the Class B Big State League, then their New Orleans Pelicans club in the Double-A Southern Association. He joined the Pittsburgh front office in 1955, reunited with Rickey, who was in his final season as general manager. When Rickey, 73, retired to become the club's board chairman at the close of the 1955 campaign, Brown was the unanimous choice of that board (which also included part-owner Bing Crosby, the entertainer) to succeed him. Brown's first order of business was to find a successor to fired skipper Fred Haney. While his first choice, Bobby Bragan, was a misfire, Brown struck gold in August 1957 when he replaced Bragan with Danny Murtaugh, a former Pirate second baseman then in his second season as a coach. Under Murtaugh, the Bucs became contenders in 1958, and won the 1960 and 1971 World Series. Although he twice was compelled to step down for health reasons, Murtaugh would serve four separate terms as Brown's field manager (1957–64; 1967; 1970–71; 1973–76), and compile a 1,115–950 (.540) record. Two months after Brown's and Murtaugh's joint retirement after the 1976 campaign, Murtaugh suffered a fatal stroke at age 59. Brown maintained and built upon the strong scouting and player development system created during Rickey's term as the Bucs' general manager. He also swung multiple shrewd trades, acquiring players such as Harvey Haddix, Smoky Burgess, Bill Virdon, Don Hoak, Hal Smith and Vinegar Bend Mizell, who would play key roles in Pittsburgh's 1960 championship. His 1971 club was almost exclusively produced from the Pirates' strong farm system, which mined talent from the Caribbean and Latin America. Brown would frequently accompany fabled scout Howie Haak on Haak's trips to Latin America. After almost a decade of semi-retirement (he remained a Southern California-based scout for the Bucs) Brown was called back into harness in 1985 to serve as acting general manager as the Pirates, rocked by a drug scandal, poor play and falling attendance, were sold by the John W. Galbreath family to a local consortium. He died on August 15, 2010, in Albuquerque, New Mexico at the age of 91. "Pirates Pick Brown: Rickey Successor Predicts Pennant", The New York Times, Oct. 25, 1955.